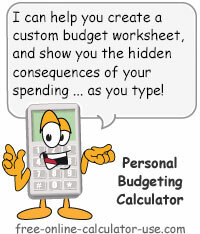 This calculator will help you to formulate a realistic personal budget and allow you to print out any number of personalized, printable budget worksheets. Plus, unlike other online budget calculators, this calculator will alert you to the opportunity costs (work time and lost interest) of your spending as you complete each entry into the budget form. If you would prefer to enter your budget amounts on a month-by-month basis, and you are already fully aware of the opportunity costs being created your spending, you might want to use the Monthly Budget Calculator. Create a realistic budget that will alert you to the little known opportunity costs of spending, which can be a real game changer! This section provides fields and choices that will be used by the remainder of the calculator. Note that you can change any of these preferences at any time and the calculator will readjust its displays and results accordingly. The real hourly wage (RHW), Expected ROI, and Cost years fields are entries needed to calculate the opportunity cost (what you are giving up) of each budget item amount. I highly recommend you complete these fields and then pay very close attention to the results they create. If you simply want to print out a blank budget worksheet, select your preferred budget period, edit the category and account titles, scroll to the bottom of the calculator and tap the "Printable Budget Sheet" button. Enter the average number of days you work each week. This will allow you to indicate when expenses only apply to workdays, which the personal budgeting calculator can then translate into a total for the selected budgeting time period. Select your preferred budget time period. For most people this will be Monthly. However, if you prefer a different time period, select your preference and all amounts will be translated into your preferred time period. You can change your preference before, during, or after completing the budgeting form as the calculator will automatically recalculate the form. Enter your real hourly wage. This will allow you to see how many hours you will need to allocate to working each budget time period in order to earn enough after-tax, after-work-related expense income to pay for each budgeted item. Clicking on the link will open the Real Hourly Wage Calculator in a new window. Enter the annual percentage rate you expect to earn on your investments. Enter as a percentage, but without the percent sign. This figure will be used to estimate the potential future value of the money you are spending. 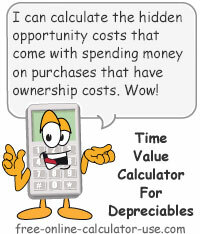 Enter the number of years you would like the calculator to use when estimating future value. This figure will be used to estimate the potential future value of the money you are spending. If you would like to clear the sample category and expense titles so you can enter your own, tap the "Clr" button. If you cleared the sample titles but you wish to reload them, tap the "Load Sample" button. Note that either of the two buttons in this section will zero out any amounts you have entered into the section below. Tap the plus (+) icon to show the 10 income source lines. Tap the text button in any row to open up an income source form for that row. Once you have edited the source name and entered or edited the amount and frequency, tap the "Save" button to save the changes and close the form. Categories: Tap the plus signs (+) to expand each category. Tap the category names to edit them. Expenses: After expanding a category, tap any expense name (or "Blank") to open a popup form wherein you can make changes to the name, expense type, budget amount, and frequency. Save: After the expense name, type, amount, and frequency have been edited, tap the "Save" button to save the changes and close the entry form. Tapping the "Save" button will close the popup and save the changes to the main worksheet, whereas tapping the "Cancel" button will close the popup without saving the changes. Tap the text links to show and hide field instructions. This section of the calculator will keep an updated monthly summary of your income and expense entries. This is the total amount of income you entered, translated into your preferred budget time period. This is the total amount of living expense, payments and savings you entered, translated into your preferred budget time period. This is the total of your budgeted income less your budgeted living expenses, payments and savings. A negative sign indicates you have a budget shortfall (more money going out than is coming in). No negative sign indicates a budget surplus (more money coming in than is going out). This is the total of all budgeted items for which you chose the "Fixed" option. A fixed budget item is one that is typically difficult or impossible to reduce, because doing so would have an adverse affect on the health and welfare of the household. This is the total of all budgeted items for which you chose the "Variable" option. A variable budget item is typically one that can be reduced with a reasonable amount of effort, and without having an adverse affect on the health and welfare of the household. This is the total of all budgeted items in which the payment frequency exceeds your preferred budget time period. For example, if your preferred budget time period is monthly, and your auto insurance premium is paid semi-annually (twice per year), 1/6 of the premium will be added to this set-aside amount. This helps to insure that you will have the cash set aside to pay all non-preferred-period expenses as they come due. Tapping the button below will open your budget worksheet in a new window. You can tap the button at any time during your entering and editing of budget preferences, categories, and expenses. If you're not satisfied with the worksheet simply close the worksheet window, adjust your entries, and then recreate the worksheet. Complete the Budget Preferences section, which includes your preferred budget time period and your entries related to calculating the opportunity costs of your spending. If you would like to create your own category and expense titles, tap the "Clr" button. Tap the plus (+) sign in the "Income" row to show the ten sub-categories. Then tap any row button to open a form for editing the income name, amount, and frequency of the income expected from that source. Tap any expense category name to open a form for changing the name. Tap the plus (+) sign in an expense category row to show the ten sub-categories. Then tap any row button to open a form for editing the expense name, type, amount, and frequency. When you are satisfied with your budget, tap the "Printable Budget Sheet" button. This will open a new window containing your completed budget. To successfully tracking and budgeting your income and expenses. The number one key to creating a budget that you will stick with, is to make absolutely sure that your budget is based on reality instead of on delusional optimism. The only way you can base your budget on reality is to create your budget using your past spending as a guide. Only your past spending can provide the necessary proof that you have the self-discipline needed to stay within your budgeted amounts. In other words, it's one thing to remove "ice cream cones" from your budget on paper, it's another thing to walk past an ice cream stand on a hot summer day without buying an ice cream cone. If you are not meticulously tracking and tallying-up your day-to-day spending, your chances of creating a realistic budget that works are somewhere between slim and none. Never walk away from an expenditure without a legible receipt, and always put all receipts in the same spot in your wallet or purse. If you allow clerks to put your receipts in a bag, or you fail ask for receipts, the written records of those expenditures may be gone forever, and along with them will go your chance at creating a realistic budget that works. Remove your receipts from the designated spot in your wallet or purse. 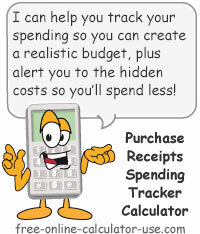 Enter all receipts into your spending tracker software or notebook. This will insure that you have everything you need to create a realistic budget that works. Eliminate the word "Spending" from your vocabulary, and replace it with the word "Investing." As an "investor" of your money rather than a "spender" you will be more apt to weigh what you are giving up in return for what you are getting. What you give up is what's often referred to as, " The Opportunity Costs of Spending." In case you're not familiar with the term, opportunity costs can be defined as the value of what you give up by choosing one alternative over all other available alternatives. One of the most overlooked opportunity costs of spending money on non-appreciating purchases (items whose value does not grow over time), is the opportunity cost of lost interest earnings. For every dollar of your income you spend on a non-appreciating purchase, you simultaneously give up the right to earn interest on that particular dollar ... for the rest of your life. As the free personal budgeting calculator will help you to discover, the opportunity cost of lost interest earnings can add up to millions of dollars over the course of your lifetime. Do You Love Spending Time at Your Job? As an investor of your money, one of the things you give up when "spending" an amount of money, is the time you had to spend earning that amount of money. How many hours will I have to spend at work in order to earn the after-tax, after-work-related-expense income to needed to pay for the item I'm budgeting for? If you hate your job and/or you hate spending time away from your loved ones, then any emotional gains you get from spending your money needs to be high enough to offset the emotional losses you are experiencing from spending time at your job. Otherwise, if the emotional loss from working to pay for the item is greater than the emotional gain from the purchased item, you will have suffered an emotional net-loss (poor investment) from your "expenditure." Suffer enough of these emotional net-losses, and you could find yourself in emotional bankruptcy. If you are suffering constant emotional net-losses from your "spending," I would suggest investing your money in investments that will help you to transition to a work you will enjoy (investments such as education, training, invest in your debt, etc. ).